How can immersive methods improve safety training? Home » Blog » Workplace health and safety » How can immersive methods improve safety training? Business is always looking for better ways to train their employees and safety training is one area that improvement sees immediate results via a decrease in incidents and injuries. The problem is most safety training is delivered as ‘death by PowerPoint’ in the classroom or online through e-learning platforms. This is mainly due to the prohibitive costs to deliver safety training in any other format and the logistical challenges when employees are scattered about across sites, regions and countries. Business is challenged with continued poor performance due to budget and time constraints. However, technology is now able to provide cost effective and time efficient safety training delivered across smart devices and online through 360 degree panoramas. As this technology improves and interacts with augmented reality hardware, such as the Microsoft HoloLens, we will see an intersection between 360 degree photographic images that are manipulated to show realistic and relatable content, overlaid with holographic and interactive areas that users tap or click on for more information and assessment activities. As time goes on, the technology will become mainstream and subsequently less expensive. This is an area of software development that Tap Into Safety are actively working in, and our safety training is an example. Some recent US research looked at the effectiveness of using augmented 360-degree panoramas of live construction sites to improve the hazard-identification skills of construction workers. The results showed that 360-degree panoramas and augmentation are a major advantage in learning hazard identification. Safety training delivery is changing and changing fast due to new employees being part of a technology-savvy generation. Their expectation on receiving interactive, relevant safety training is influenced by their increased use of smart phones, gaming platforms, social media and real time interactions with global peers on a daily basis. Training is no longer consumed by this generation as it’s been in the past via passive deliveries, e.g. classroom chalk and talk. There is now more emphasis than ever to create engaging learning experiences that adopt virtual technologies and digital sites. Virtual Reality (VR) was the first technology to make the move into active learning experiences. Virtual models simulate and replace real-world environments. However, while VR is often very effective in its delivery, it’s not as realistic as a real-world job site. Logistics are also problematic in that the user wears a set of goggles and needs free space to move around. Delivery is often bound to a classroom and the training may be difficult to deliver remotely. Modelling close-to-reality scenes requires signiﬁcant effort in terms of time to achieve a sufﬁciently realistic representation of reality and often entails high computational cost for the rendering of all the elements on each scene. 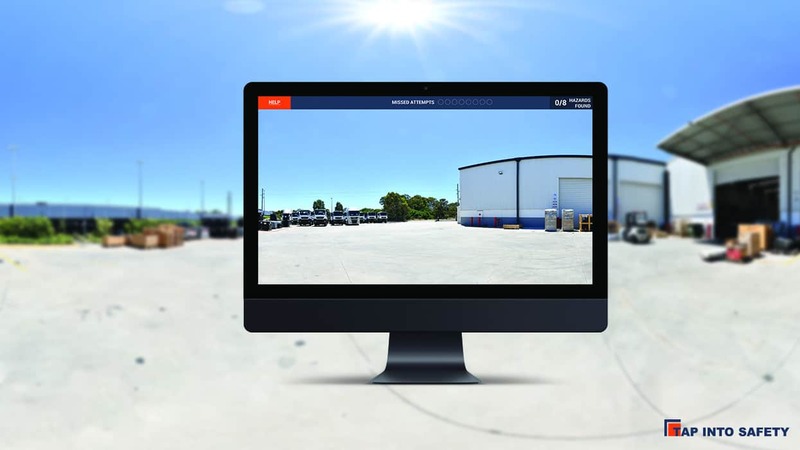 An emerging technology is 360-degree photographic panoramas of real work sites to deliver construction training. The delivery is highly realistic because it uses real world examples while continuing the immersive experience with the addition of augmented features of superimposing information layers over complex workplace scenes. The advantage of this delivery method is the ability to develop training specifically for industries such as construction and to drill down to details nuanced in that sector. The environment that is photographed is rich in data and context and challenges the employee to find safety issues within their typical working environment. Pro-active hazard identification and rectification has been shown to reduce workplace incidents and injuries. While the conclusion to this study was that 360-degree panoramas and augmentation are a major advantage in learning hazard identification, there were a number of questions raised. This research investigated a proof of concept on a piece of software that was recently developed and trialed in the US. They identified a number of limitations to that safety training solution. The authors and end users were critical of the panoramic image quality, parallax issues with the stitching of images, only having prearranged hazard example content in the scene and the location of the hazards in the scene meant some were too close and others were too far away. At Tap Into Safety we can produce a panoramic image that is exceptionally high quality, while at the same time allowing for acceptable download times when in use by employees on mobile devices and online. Technology has improved since the conducting of this research to provide excellent stitching that is seamless with no ripples or errors or parallax issues. However, to achieve such exceptional results we rely on skilled Digital Designers to manipulate the images post production. The criticism of the limitations within the scene to only display prearranged staged hazards, is overcome by Tap Into Safety post-production using photo manipulation. In our 360-degree panoramas we stage what we can while keeping the scene safe as we work in live sites, and Photoshop in what we can’t safely stage. Finally, placement of the hazards in the panoramic scene is paramount to a successful experience by the end user. because we manipulate the images post-production we overcome the objection of hazards too close or too far in the distance to be effectively seen. In addition, the Tap Into Safety software uses zoom functionality to enable magnified interrogation of the scene, while retaining high quality images. The proof can be seen in our free demo.